When we were in Paris, we had the loveliest brunch at Trieze. Trieze is a southern comfort meets French restaurant and they had this homemade blueberry jam they served with biscuits. I haven’t been able to stop thinking about how amazing that jam was! 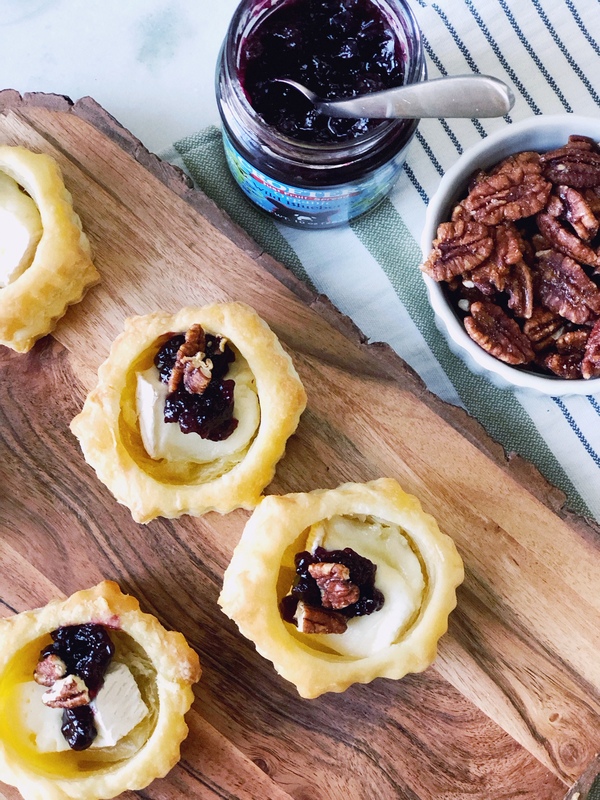 The flavor of that biscuit jam combo inspired these Brie bites baked in puff pastry shells and topped with blueberry jam. 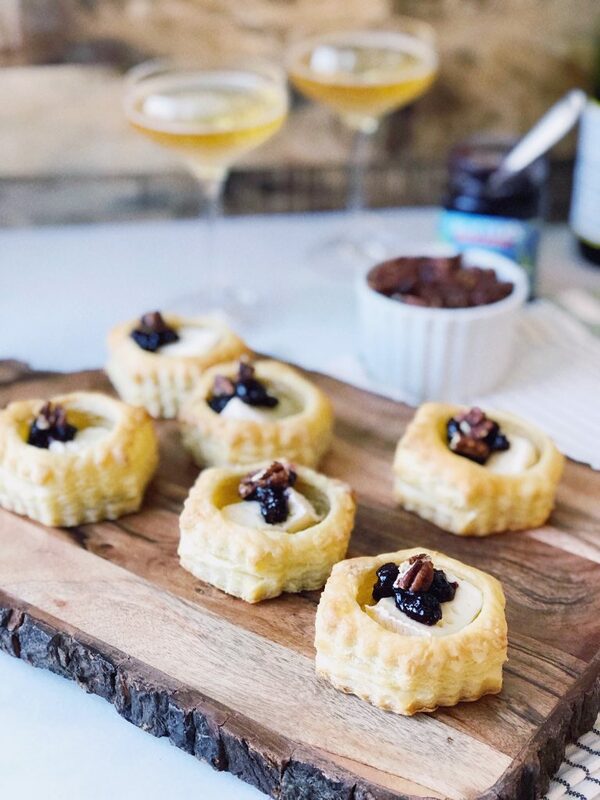 They’re such a nice little treat, and I love the idea of serving them at a brunch paired with a dry champagne. 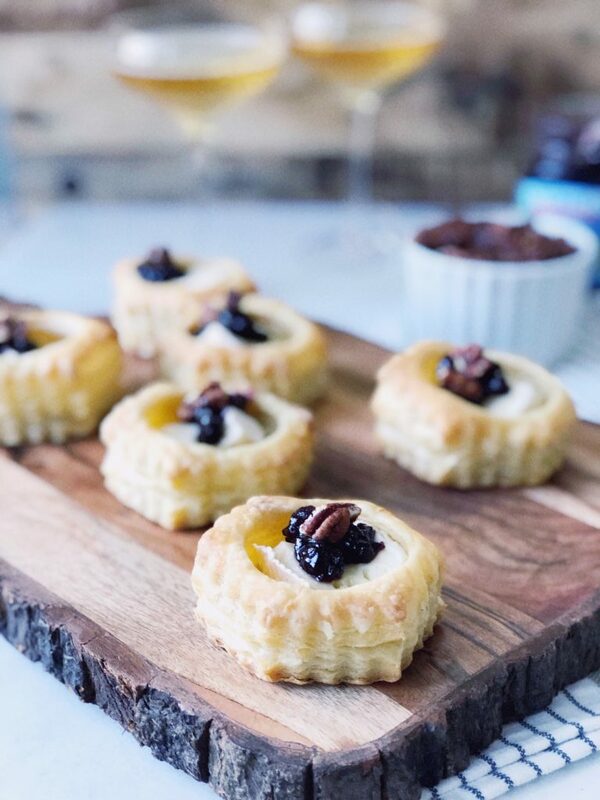 The puff pastry is so buttery and warm, and the Brie is creamy and the jam is tart and sweet. You could bite right into these or savor them with a knife and fork; I have to say, I want to savor every single bite! 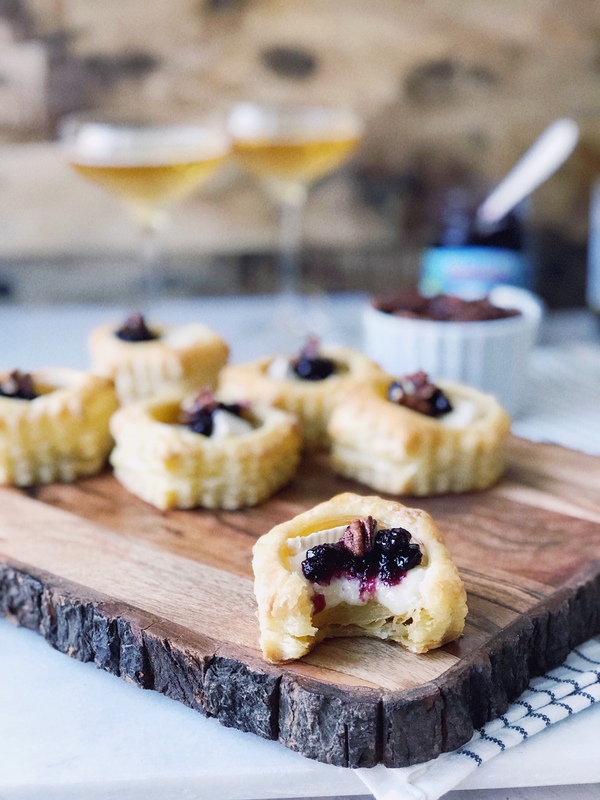 I used Peppridge Farms puff pastry shells for this, which are in the frozen section at your grocery store I think you can take the ingredients of this and cut little squares from crescent dough and bundle these up and bake them in a mini muffin tin! You’ll certainly get more servings that way since the puff pastry shells come in a box of 6. I do think the shells are prettier no? Next time I make these I’m going to try pear jam with the Brie! I think it’ll be a great flavor for champagne and the sweetness of pear would be a great compliment to the Brie! Inspired by brunch in Paris, this hot appetizer will feel like an elegant start to a dinner party or brunch. See recipe notes for using crescent dough instead of puff pastry shells. 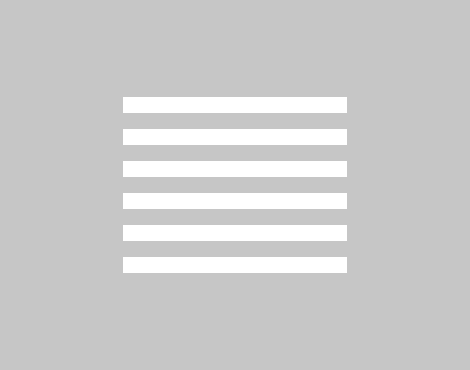 Place puff pastry shells on prepared baking sheet, according to package instructions. 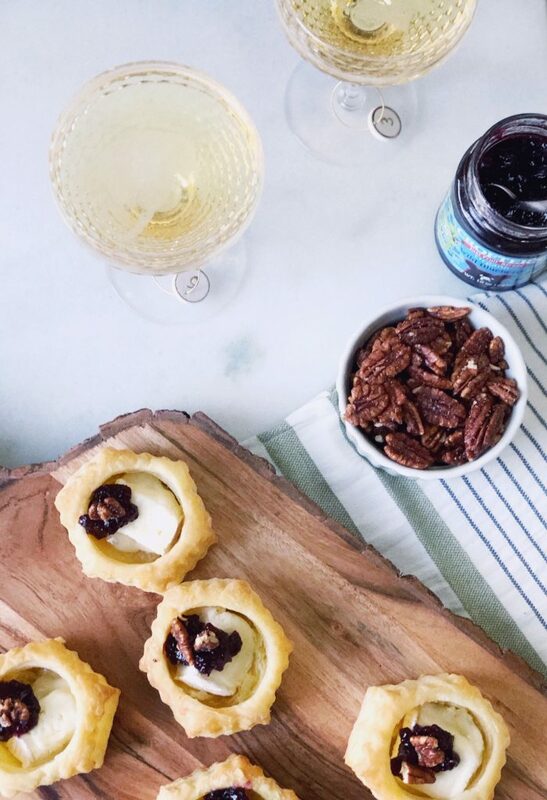 Place brie in each shell, top with jam and garnish with pecans. Preheat the oven according to package instructions. 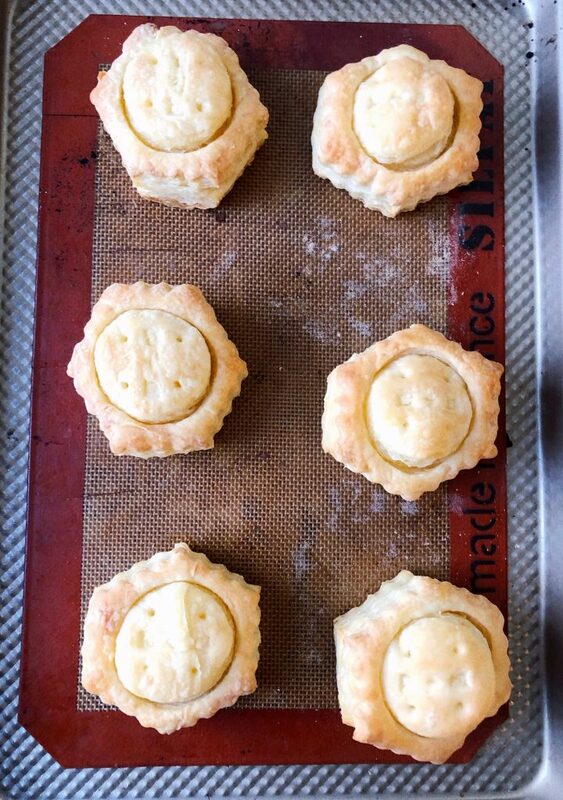 Cut small squares and place brie and jam in the squares, folding the corners into a little package. Place in mini muffin tin, bake according to package instructions or until golden brown. Let the bites cool 3-5 minutes and serve immediately.